Lauren Waldrip admits she’s a bit of a sports fanatic. She remembers calling the Hogs at a very early age. As a member of the Razorback Diamond Dolls, a spirit and volunteer group at Arkansas Razorback baseball games, Lauren is quick to point out that she’s in the middle of all the action, whether it be hearing colorful language from an angry visiting coach or watching a baseball sail over the chain link fence onto Razorback Road. Even her Kappa Kappa Gamma sorority sisters are familiar with her passion for sports. While others may want to watch “Harry Potter” or some other program, “I’m the one at the Kappa house who’s just trying to watch ‘SportsCenter,’ ” she says of the ESPN television show. Lauren, a senior at the Sam M. Walton College of Business, is majoring in both marketing and public relations with a minor in accounting. She says she’s already practicing what she has learned as she goes about her Diamond Doll activities such as greeting visitors and assisting in the dugouts. “This is just another example of PR,” she says. She’s also making good professional contacts by working with university athletics and the marketing department. When she interned last summer as a legislative assistant for U.S. Sen. John Boozman, she chose agriculture as her focus. She wrote press releases for Boozman’s website, attended legislative hearings and corresponded with constituents. As vice president for Associated Student Government, she serves as a voice for those attending the University of Arkansas. She does this through spending time with ASG cabinet members and discussing what’s important to them and overseeing programming on campus, which includes being involved with every aspect of planning an event. In August, she helped organized Welcome Week, a series of events on campus welcoming students, staff and faculty to a new school year. Among other events, she also worked closely with the Student Alumni Board to plan homecoming. Many ask her if she’s honing herself for a political career. “I just say, ‘no,’ ASG is about serving the students, not politics,” she says. Her concern, as ASG vice president, is to represent and serve the students, nothing else, she says. “During my first semester, I was undeclared,” she says. “Then I decided to go with Walton College. 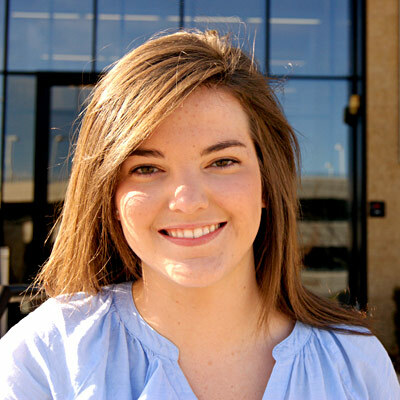 I knew how strong Walton College is and what it means to a degree.” As a Walton College Student Ambassador, she is able to share her passion for the college with potential students. Lauren says she’s keeping her options open for now, though she plans to eventually go to graduate school. “I just know how beneficial it can be to my career at some point,” she says. 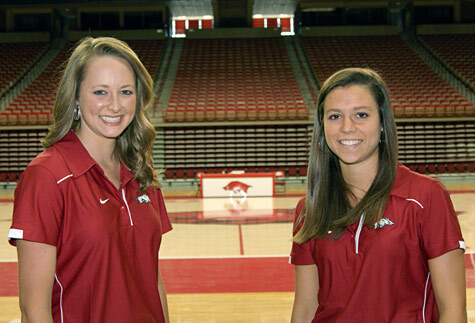 With their red, athletic shirts bearing Razorback and Nike logos, it’s common for Kristin Wilmes and Haley Prewett to be mistaken for University of Arkansas athletes. But the two Sam M. Walton College of Business undergraduates are actually interns who work behind the scenes for the Razorbacks. 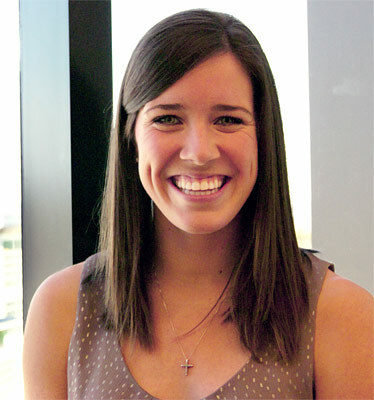 Kristin works in the marketing office, where she plans and executes promotions for athletic events. Haley works in the business office, practicing her accounting skills and making travel arrangements. Both of these honor students say they dream of a career that involves sports. Kristin hopes to someday work for the St. Louis Cardinals baseball team, though she’s considering marketing for a foundation or charity. Haley aspires to be an athletic director or a chief financial officer for a professional sports team. Kristin, a senior from Joplin, Mo., says she became a fan of the University of Arkansas after her older brother attended college here. But she says it was Walton College’s rankings and good reputation that lured her to the business school. Majoring in marketing with a minor in Spanish, Kristin has participated in Leadership Walton, a program offered to business students that provides training applicable to the real world, and Clubbe Economique, a student organization that aims to enrich students’ economic knowledge through visiting speakers. She says a benefit to her honors’ classes is that they have fewer students, which means more one-on-one time with the instructor. “I feel like the teachers really know you,” she says. 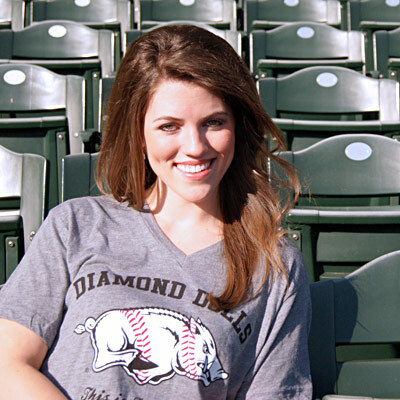 During the fall semester of her sophomore year, Kristin began working for the Razorbacks’ marketing office, where she works with promotional items, children’s activities, in-game promotions, autographs by the student athletes and at least one other thing: shooting the T-shirt gun at crowds during sporting events, allowing lucky recipients to receive free Razorback T-shirts. Between her Walton College education and her internship, she says she feels she has the skills and knowledge to succeed in the real world. “The people that I have worked with in the sports marketing department are incredible, and I have learned a lot from each of them,” Kristin says. Like Kristin, Haley has family ties to the University of Arkansas; her father attended law school here. She says she grew up a Razorback fan in her hometown of Russellville and knew how to “call the Hogs” at a young age. When her love for sports kept growing, she began to consider a career in the field. While still in high school, she visited the Arkansas athletic department staff to get a jump start on her chosen career. By her freshman year, she had landed an internship. With a major in accounting and a minor in recreation and sports management, Haley has gained experience organizing group travel arrangements, such as airfare and other related accommodations for the Razorbacks. She also helps with deposits and budget reports, she says. Now, with her eyes set on being an athletic director, she recognizes it’s a male-dominated field, “but I’m going to work toward that goal,” she says. She’s also enjoying life as a Walton College student. This summer, she will study abroad in Belize with other Walton College students. Haley says after she graduates, she hopes to get a master’s degree, possibly in sports business. “The networks I’ve made will be very beneficial in the future,” she says. Kristin says the same applies to her. “The Walton College has been really good about pushing those networks,” she says. For Haley, her Walton College education and athletic department internship convince her she’s choosing the right career path. Some college students spend years figuring out their career path, but Kristen Zachary says she knew it the moment she stepped foot on the University of Arkansas campus. “When I came to college, I always wanted to be in business,” she says. That part was easy. Narrowing it down to a major took a little self-discovery. She thought about going into accounting. After all, she had always been good with numbers. But after taking a classes in the Sam M. Walton College of Business, the lure of marketing and communications was too strong to resist. The consumer behavior courses fascinated her. She also loved the idea of building relationships with other people and entities. 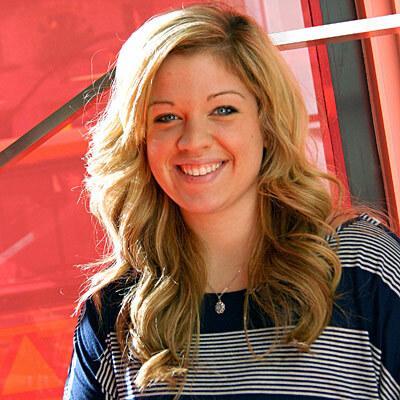 A junior majoring in marketing with a minor in communications, Kristen says she has found the right fit. Kristen says when she graduates in May 2013, she hopes to work for a company or an organization where she can best use her skills. She has already had plenty of practice as an undergraduate. The Tulsa, Okla., native is vice president of development for her sorority, Pi Beta Phi. Her duties include facilitating workshops, monitoring academics and overseeing committees, she says. It also enables her to get plenty of practice in public speaking – something that is becoming easier for her. 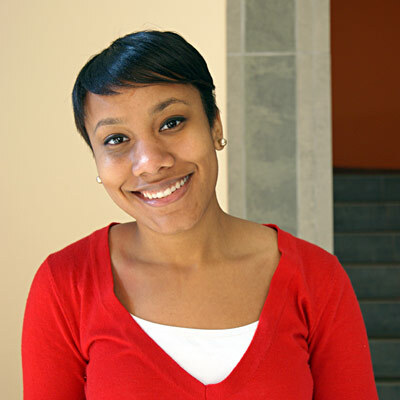 She also is a co-leader of the Walton Honors Student Executive Board, which is in its first year. Kristen says the group is comprised of 16 honor students who work toward building alumni relations and organize social and marketing activities for the college. Her duties took her to Boston College, where she and another executive board representative visited with hopes of modeling a program similar to one there. Her summers have been spent working at Camp War Eagle near Rogers, about 30 miles northeast of Fayetteville. This also enabled her to build relationships and develop communication skills. Kristen also is a member of the American Marketing Association’s university chapter and Gamma Beta Phi, an honor society open to students in the top 20 percent of their class. Going to the University of Arkansas deviated from the Zachary family norm. She says family members, including her parents, attended Oklahoma State University. “I just kind of wanted to do something different,” she says. She discovered that Fayetteville is just the place for that “something different” – she’s far enough away for new experiences while being close enough to home to visit on a whim. All while finding her place in the world. “My honors classes have really challenged me and helped me grow,” she says. Last summer, Kristen Howell taught Chinese business professionals a thing or two about American culture. For example, with the help of an English-speaking translator, she showed them the proper way to shake hands and how to speak to a superior. She also discovered that many of those she met learned English through movies and televisions shows. “Friends” is a big hit there, she says. Kristen says she never thought of herself as a world traveler until her China visit, but she was aware of its global impact. “I knew that China was a force to be reckoned with in the business world,” she says. She traveled to China with the help of the University of Arkansas and CRCC Asia. It’s offered through the George W. Edwards Jr. Career Center at the Sam M. Walton College of Business and Leadership Walton, a program that helps prepare students for the professional world. Kristen says she found the transportation system extremely efficient in downtown Beijing, where she worked. Just getting around the city was educational on many levels, and she advocates that college students jump at the opportunity to go there. “I think [visiting] China is good for any kind of major,” says the University of Arkansas junior from Keller, Texas, which is located near Dallas and Fort Worth. She says she worked for a small firm that wants to be more marketable globally. “I attribute what I know, and the knowledge that I had in the conversations with company department heads, from the core classes,” she says. She was referring to Walton College’s pre-business core classes required before a student can take junior- and senior-level courses. Like many students who become accounting majors, Kristen says she always liked working with numbers. Though she had toyed with becoming a marketing major, she says it was her core class in accounting that made her realize she had a knack for it. Following her senior year, she says she hopes to continue her accounting education through the Integrated Master of Accountancy (IMAcc) program, which, upon completion, makes students eligible to become certified public accountants. After that, she says she hopes to be hired with one of The Big Four accounting firms: PricewaterhouseCoopers, Deloitte Touche Tohmatsu, Ernst & Young and KPMG. Kristen currently has an internship in the state income tax department at Tyson Foods Inc., where she helps the company prepare its returns. She says the job was the result of her China internship, where her duties also included dealing with taxes. As a student, Kristen serves as a Walton College Student Ambassador, where, among other things, she gives campus tours to prospective students. She is also a project leader for the university’s chapter of S.I.F.E. (Students in Free Enterprise), which has since changed its name to Enactus, and a member of the Zeta Tau Alpha sorority. Downtime, she says, involves hanging out with friends and exploring the community that surrounds the campus. She says she loves dining out at the different restaurants and shopping at stores in the area. Working with older people or operating a payment-friendly restaurant affordable to all. These are two ideas Keri Stubbs is kicking around as she majors in both management and finance at Sam M. Walton College of Business. The thought of working with those much older came to Keri while she was in high school in Cassville, Mo., when she was in Future Business Leaders of America. One project involved making Valentine’s Day cards to give to members of the local senior center. Fast forward to an entrepreneurship class Keri took at the University of Arkansas. There, she wrote a paper on “pay-what-you-can” restaurants where patrons decide how much their meals are worth. The idea is that those who are financially secure will more than pay the suggested price, compensating for those who can’t, Keri says. Many restaurants have tried this, including Panera Bread. This experimental model, with its obvious challenges, fascinate her. “It’s a risky business,” she says. As a junior, Keri still has time to figure out her career path. With a minor in marketing, her concentration in three fields can open doors to many opportunities, she says. Keri could have attended college in her home state. But the University of Arkansas roots run deep in her household. Her parents, who are both from Arkansas, met at a Razorback ballgame. In fact, several of her family members have names engraved on the campus’ Senior Walk, which lists every graduate from the institution. “I grew up always having been a Razorback fan,” she says. Keri admits that she briefly flirted with the idea of going to school elsewhere. In hindsight, she says, it was rebellion. When that passed, she applied to the University of Arkansas. It was her only college application. “I haven’t regretted it since,” she says. Growing up in Cassville, located about 60 miles northeast of Fayetteville, the University of Arkansas is a completely different world from her hometown of about 3,000, she says. Once at the university, she says it took her some time to find her place. Freshman Business Connections, a first-year program for business majors, helped, she says. Her participation in the program inspired her to become a Freshman Business Connections mentor, advising new students who were once in her shoes. While she says serving as a mentor to first-year students is rewarding, being a Walton College Student Ambassador, where she gives campus tours to potential students, adds a new dimension to her college volunteerism. “Getting them before they’re freshmen is always exciting,” she says. 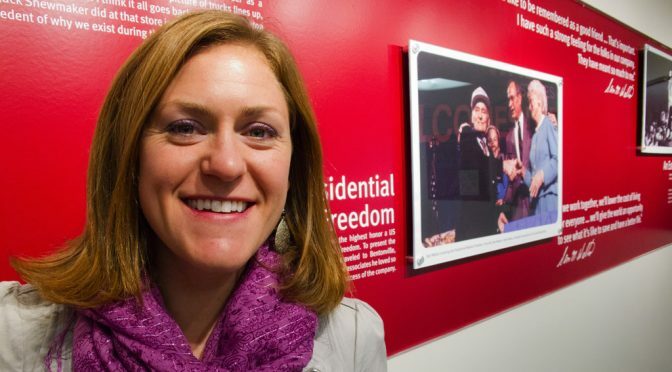 Her involvement with Students in Free Enterprise (S.I.F.E. 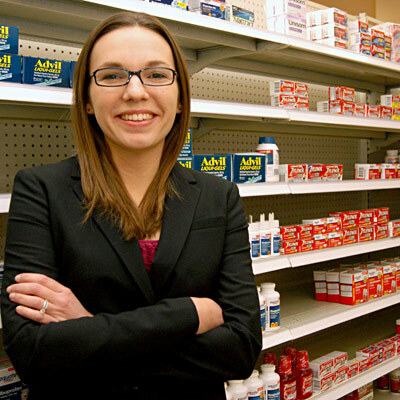 ), now Enactus, where she served on the leadership team, enlightened her to other possibilities a business degree can do. One of the S.I.F.E. projects entailed helping Mama Dean’s Soul Food Kitchen restaurant with its bookkeeping along with assisting a charitable meal program. She also participates in Leadership Walton, a program offered to business students that provides training applicable to the real world, such as business etiquette, networking and community service. But it goes back to her professors, who provide the core knowledge she needs to be successful. “The projects that they have in classes are applicable to the real world,” she says. He lives in Fayetteville. He also lives in Little Rock. To further complicate things, his fianceé lives in Turkey. As in the country Turkey. Welcome to Kellen Utecht’s world. For three or so days a week, Kellen is in Fayetteville, pursuing a master’s degree in business administration at the Sam M. Walton College of Business. Then, it’s off to Little Rock, where he is also a student at the University of Arkansas Clinton School of Public Service, working toward a master’s degree in – you guessed it – public service. Kellen says he learned about the combined master’s program by “Googling” the words “MBA” and “public service.” On the second page of the results, he found a link to an article about Sarah Clark, the first student to complete concurrent master’s degrees in business administration and public service through a partnership between the Clinton School and the Walton College. Kellen wanted to do that, too. He contacted the Walton College, grabbed his father and made an 18-hour road trip from North Dakota to Fayetteville, where he toured the campus. The next day, they drove to Little Rock and met with people there. “Then the two schools got to work, making this happen for me,” he says. Born and raised in Underwood, N.D., (“about as far from the ocean as you can possibly be”) Kellen earned a bachelor’s degree in economics from the University of North Dakota. After graduation, he spent two years as a business consultant. The Peace Corps was the obvious next step. 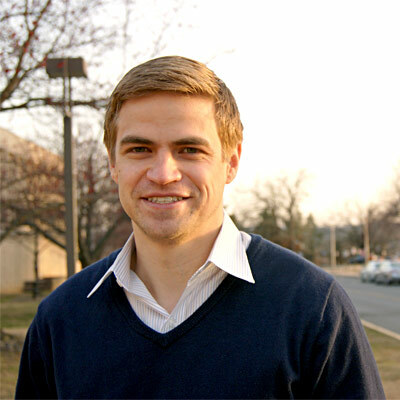 He was assigned to Bulgaria, where he served for two years as a community and organizational development volunteer. Then he enrolled at the University of Arkansas in January 2011. He did his summer internship with the Sustainability Consortium. In August, Kellen moved to Little Rock, where he enrolled at the Clinton School. He is currently interning at the headquarters of Heifer International, a hunger- and poverty-fighting charity that serves globally. Kellen says the partnership between Walton College and the Clinton School has enabled him to learn from the many speakers they have brought in, including past presidents as well as leaders from the business world. He also enjoys that on one day he could be doing a SAP simulation and the next day discussing the decolonization of India. “The Walton College and Clinton School together have helped make me realize I want to work in supply chain sustainability,” he says. One way he might do this is through working with either a for-profit business or non-governmental organization in its sustainability efforts and communicating its progress to stakeholders. He will continue his international studies this summer, when he travels to Turkey and does an internship with the World Wildlife Fund. He says he met his fianceé, Tugce, while backpacking in Turkey following his stint with the Peace Corps. She’s finishing law school while he completes his master’s degree. “Beyond that, I don’t know what will happen,” he says. Yet, he says he knows his education here in Arkansas will help him with his pursuits. “There’s so much good work to be done out there, and I want to be a part of it,” he says. Imagine starting a new job, getting married to your high school sweetheart, and enjoying the life of a newlywed. Now imagine all of this happening with the eyes of the nation on you and your husband. 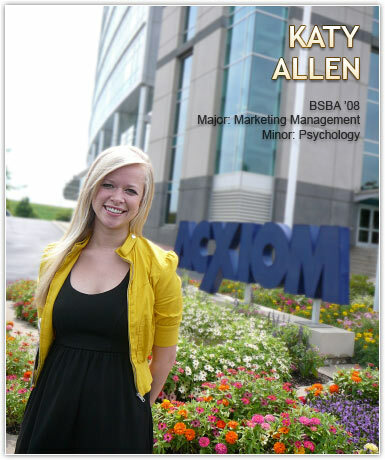 Welcome to the life of Katy O’Connell Allen, a recent Walton College graduate, sales support specialist with Acxiom, and – oh yes – the wife of 2009 American Idol, Kris Allen. Those who watched Idol faithfully during the eighth season may recognize Allen from the audience – a joyful presence who always maintained a sunny smile and happy disposition as she cheered on her husband from week to week. But, onlookers should also know that there is more to Allen than just Idol. In fact, she is a smart, kind-hearted alumna who has represented her state and her company exceptionally well and has proven to be a diligent worker despite all of the distractions – and excitement – that life has thrown at her. Allen says the Walton College prepared her for both her current position with Acxiom and her position in the American Idol spotlight with her husband, who won the title on May 20, 2009. She notes that her job with Acxiom, which she started in June 2008, was a direct result of being a student in the Walton College and the assistance she received from Renee Clay, assistant director of the George W. Edwards Jr. Career Center. Allen says Clay coached her for the interview process and, as a result, she felt very prepared. In addition to this, her student presentations and research projects enhanced her skill set, as did her study abroad experience in Italy, which, she comments, was good preparation and “a great experience for [her] life now.” When it comes to American Idol, Allen admits that while she isn’t directly involved in her husband’s management, her marketing background does give her the ability to relate to his management team and understand what they’re doing for his career. When asked about how she maintains a work/life balance, Allen laughs and says it was a challenge from the beginning. Her wedding to Kris, which she was planning as she started working for Acxiom, could have been a major distraction at the time, but she quickly learned how to keep her focus. During Idol, Allen admits that working on Tuesdays and Wednesdays was the hardest for her since she was usually stressed about the show. Kris, on the other hand, remained relaxed with the mentality that “whatever happens, happens.” As Kris continued to advance in the competition, Allen says it became a “surreal experience” and a bigger deal each week. To make up for the stressful days in the middle of the week, Allen often worked weekends to compensate. Another challenge in her life now is planning or, rather, the lack of it. Allen admits she’s always been a big planner and enjoys knowing what’s coming next in her life, but that’s simply not possible now. It’s gradually getting easier for her as she learns to take life as it comes. However, a career change is ultimately on the horizon since she and Kris will be moving to L.A. for a while. No matter what she chooses, though, she believes that Arkansas – and central Arkansas in particular – will always be a home for them. To face these challenges and others, Allen draws inspiration from her friends and family. She says there are certain friends who are so encouraging and inspirational that they have gotten her through this entire experience. She is also inspired to see Kris be so successful and by others who are grounded and maintain positive attitudes. In the future, Allen and her husband hope to channel their passions for mission work and humanitarianism by establishing a foundation. She notes that they would like to “do something really cool in a big way” since they have always cared about helping others who are less fortunate. Allen, who was listed in Google’s Hot 100 Search Trends in May 2009, “loves the Walton College” and “had a great time” here. Where the future takes her, she does not know. However, we’re confident that this former homecoming queen will continue to shine in the spotlight. Dr. Katie Kelting had just graduated from high school and was getting a jumpstart on her college career as she sat in orientation, waiting to enroll in summer school. When she was asked to pick a major, she deferred the matter to her father, the chief financial officer for a bank. “He said, ‘I think business is good,’” she recalls. Through the course of her undergraduate career, she took the requisite business classes. But one called Principles of Marketing hit home with her. “I loved learning about all of the ‘behind the scenes’ strategies that marketers use to understand and attract consumers,” she says. Inspired, she asked her professor if she could be his teaching assistant the next semester. As she applied what she was learning to the real world, she became captivated by the celebrities who endorse products on television and magazines. As a sports fan, athletes caught her attention the most. Her interest became so strong, it was the topic of both her honors and graduate theses while attending school at the University of Florida, she says. With the explosion of reality television and social media, Kelting says consumers are more celebrity-obsessed than ever, and they’re watching them closely. So is she. One celebrity she’s very familiar with is former NBA basketball player Michael Jordan, whose endorsements include Gatorade, Nike and Hanes. Those products, she says, are a good fit for him – ones that people easily associate with sports. But when golfer Tiger Woods endorsed Buick in the early 2000s, the public didn’t embrace the message; they associated him more with high-end luxury cars. Some, she says, are just strange, like when rap musician 50 Cent endorsed Vitamin Water. “The resources for the lab here are amazing,” she says. The faculty and staff also impressed her, she says. “I feel I’m the most successful when I’m surrounded by nice people who are smart and will challenge me,” she says. In addition to celebrity advertising, Kelting says she also researches private-label branding. “Retailers are introducing more and more private-labels into their stores,” she says. Kelting says she’s exploring how the presence of a private-label in a category affects consumer purchases. Away from work, Kelting spends time with her husband, Bobby, a physical education teacher and coach in Rogers. She says they spend every spring break with their family and some close friends snow skiing in Colorado. She also likes to exercise, including running. Naturally, spare time also means watching sports on television. And paying attention to the commercials.